WHAT: Legally sign documents by taking a photo of yourself with your phone or webcam. Vignature must detect a face before accepting the photo. The document owner can decide whether to accept the image. WHY: Webcams are common, and front-facing cameras on smartphones have become the norm. Photos provide better a reference/audit trail than traditional electronic signatures, which often require a password/login and rely on an IP address. BACKSTORY: Matt and Kelly wanted to include an electronic-signature tool in their website solution service for lawyers, Impirus. They soon realized Vignature had massive potential -- people spend $8B a year to get documents signed -- while Impirus would always be niche. In February, they entered the Tech Wildcatters accelerator in Dallas and built two products (plus filed patents for them) in three months. WHEN/WHERE: May 2011 (iPhone/iPad app and solution for businesses) / Dallas. BUSINESS MODEL: Build brand awareness with freemium consumer app. Charge businesses a monthly fee. COMPETITION: Traditional electronic signature companies like Docusign, Echosign, Easysign and Zosh (part of YouSendIt). “We have our patent [applications], we have our name that we are going to get a lot of brand recognition around, and execution, staying ahead of the pack -- on those three fronts that’s how we’re going to protect our product,” says Matt. CUSTOMERS/GROWTH: Over 1,000 app downloads so far, testing business version with a handful of customers. WHAT A CUSTOMER SAYS: Sandra James, president and founder of background-check company Private Eyes Inc, began piloting Vignature in mid-June. About 90% of their documents get signed in 72 hours or less. “If we can reduce that time to 48 hours, it can be very significant for us and give us a cutting edge,” says Sandra. WHO BACKED IT: Tech Wildcatters, Matt and Kelly Spradley. Currently raising a $750K angel round. TOTAL RAISED: $25K from Tech Wildcatters, undisclosed amount from co-founders Matt and Kelly. WHAT AN INVESTOR SAYS: “There’s a lot of opportunity for something like this. It could go 100 different ways, but it really came down to the team, and we know they can execute,” says Gabriella Draney, co-founder and managing partner of Tech Wildcatters. 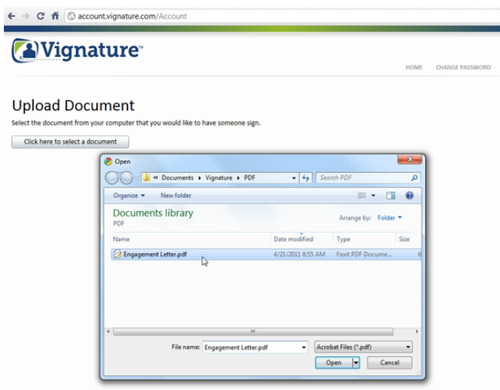 Upload a PDF to Vignature. In the pop-up box that appears next, type in the recipient’s name and email address. Click on “add Vignature block.” Drag the block to the part of the document the recipient must sign, then hit “send to recipient” button on the lower left. The recipient will receive an email notification with a link to the document. When the recipient clicks on the signature box, he is prompted to take a photo. After hitting the “adopt snapshot as signature” button, the recipient’s photo appears in the Vignature box. Recipient hits “submit signed document,” and you are notified. 2. What is the cost-saving potential of digital/electronic signature solutions?